Dentures are inherently porous, they will trap and harbor bacteria and even put you at greater risk of fungal infections. When bacteria are allowed to accumulate and grow on the inside of the denture, it poses a health risk to the patient. Studies show that bacteria inside a denture have been correlated with heart infections, Respiratory infections and lung infections. Often times the patients mouth will become fiery red and extremely sore, indicative of a fungal infection. Denture home care is therefore centered around keeping the inside of youre denture as clean as possible. 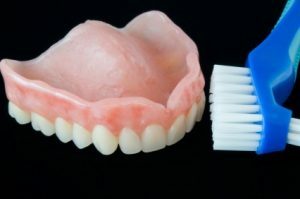 Most patients soak their denture in a denture cleaner however, the inside of the denture should be scrubbed with a soft denture brush and a denture tooth paste. Care must be taken not to use a brush that is too abrasive because an abrasive brush will scratch the inside surface and bacteria can more easily attach to the denture increasing your chance of infection. Only special denture toothpastes should be used because regular toothpastes are too abrasive and will also scratch the surface. Although denture soaking tablets kill bacteria that do not kill fungal infections therefore, your denture can be soaked periodically in bleach but for NOT MORE THAN 10 MINUTES!! Bleach will kill fungal infections. Remember to thoroughly rinse you denture after soaking it with a cleaning/disinfecting agent. Dentures should be removed from the mouth for a period of time each day. Wearing your dentures for 24 hours a day creates a dark damp environment that is well suited for growing bacteria and fungus. When your denture is out of your mouth and not being soaked in a cleaner it should be stored in water to prevent it from warping. Denture adhesives are acceptable to make well fitting dentures fit better. They are usually affective for several hours but not more. Adhesives are not a way to make ill fitting dentures fit better. This is because more and more adhesive will be needed as your mouth changes. Some adhesives have Zinc and if a lot of adhesive is being used, the Zinc and copper balance in your body will be disrupted possibly causing neurologic side effects. If your denture is not fitting well, it may need to be relined. Dentures that do not fit well will cause greater bone loss because as your mouth changes the dentures sit differently in your mouth and the bite is no longer correct. When the bite is not correct, it puts unfavorable pressure on the bone underneath causing it to “dissolve away”. Prosthodontists are specialists in the care and fabrication of dentures. They have 3 years additional training above an beyond dental school which makes them highly skilled at handling the simplest and most complex situations.